am a fan of frosted cupcakes, all boxed up to go. they were more valentiney than birthday, but nobody seemed to mind. am a fan of red hot sugary hearts. since when did i turn twelve and get such a thing for candy? am a fan of icy parking lots, if only to see the cars parked all wonky. am not so much a fan of minus eighteen degree weather. am a fan of staying in and watching the beverly hills' housewives hash it out. am mostly a fan of andy cohen. am a fan of danni's darling business cards. she is so good at crafting unique designs. am a fan of thinking about veganism; that oprah episode had me all gung-ho. until i made ritzy poppyseed chicken for dinner. am a fan of french birthday parties; ala stephmodo and darcie sanders. am a fan of christie's diy artsy pottery barn-esque book flowers. am a fan of fabric framed alphabet art by destri. am a fan of lovely snuggly made-with-love quilts; here and here. get lost in her archives; like these casual outfit formulas for moms on the go. am a fan of this sweet-as-pie children's custom board book. am a fan of benji's recent catch phrases; have fun, dad and sweet dreams, mom. am a fan of hand-lettered type for a fancy schmancy amazing bookmark. am a fan of this charming embroidery hoop wall display. am a fan of buying books for a buck. yay for the time traveler's wife. never read it before. am a fan of scheduling out my days by the hour, even if they don't go quite as i hoped. 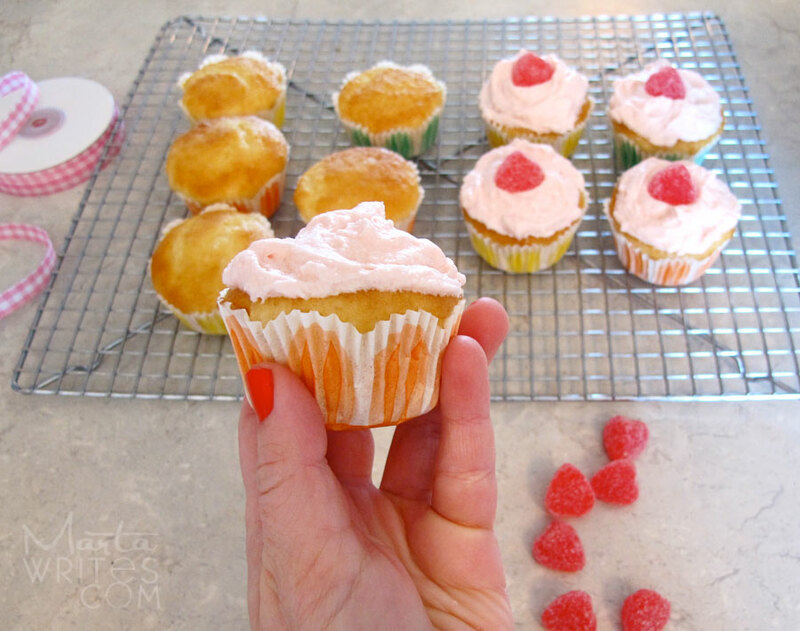 am a fan of new-to-me blogs; what katie ate / simple lovely / old sweet song. am a fan of alma and her book illustrator 101. loved chatting it up with her at ALT. am a fan of chic bubblegum necklaces and party games (bravo to their constant creativity)! am still a fan of sally hansen polish. february faves; shrimply devine and kook-a-mango (pictured). am buckling down to get a few things done next week / blogging will be sporadic. happy valentining to you. xoxo. p.s. spring mini diaries arrive next season, sign up if you'd like to be the first to know. Valentine cupcakes sound like a dream come true! Cute cupcakes for Valentine's or birthdays! I love the book page flowers too! All the blogs you linked to are great as well - I'm already a Simply Love follower but now I'm following the other ones too! Thanks for all the great links! You always find the greatest stuff. 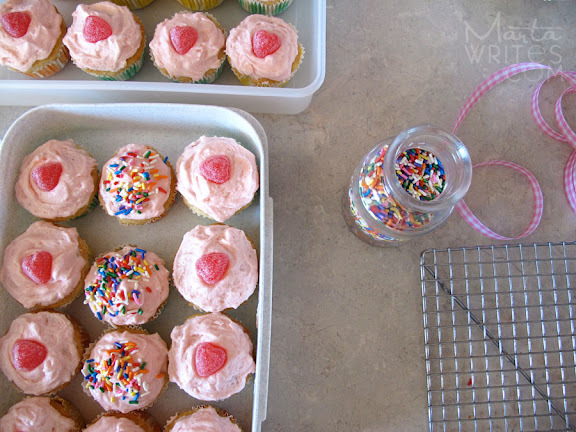 Those cupcakes are too cute! I'm not much of a fan of the minus eighteen degree weather either! Way to keep it real about Andy Cohen. He's just great and those Bev Housewives were most entertaining! Am a fan of you Marta! Have a great weekend. love these links! i hope you like time traveler's wife... it is one of my very favorites! and the time traveler's wife was a book i semi-liked, but i found myself thinking of a YW lesson about "it's great except for that one part..." like an ice cream sundae with 1 small ant on it. anway, maybe you'll let us know what you think, because a lot of women like it. Love all the links. You always point me to new & fabulous thinks. And your nail polish rocks. I am a fan of "open link in new tab"--thanks for the fun sites to click! Have a cozy weekend with your boys. I'm glad you and Angie are hanging out. Thanks for introducing me to Sallie Hansen. We're besties. 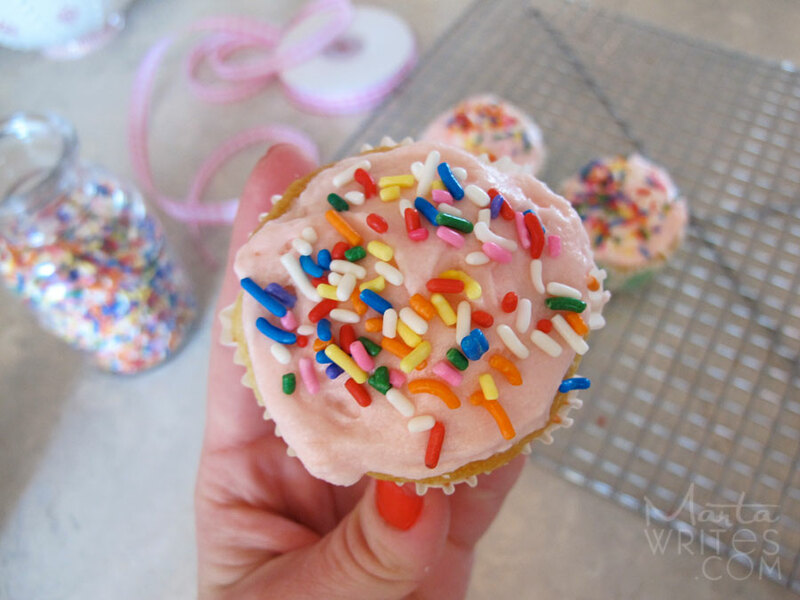 Cupcakes look way cute and I wish I could eat one right now. Totally with you on the housewives and on the vegan oprah episode. If you need help understanding time travelers wife call nick. I called him after ever chapter to get clarification. The whole time thing screwed me up! 01. i watched part of that oprah episode...it was funny and light....i was laughing....and then we went to the slaughter house. what did i expect? i guess that they wouldn't show as much as they did...you would think that the advisory warning may have tipped me off...but no. i would love to be a vegan...but how i love butter & cream....and meat. there i said it.....i love meat. 02. digging the linky love. wish i had a baby room to make the alphabet poster for....but i do have friends with babies....so i think this could be saturday's project. colourful macaroons...a thing of beauty. almost to pretty to eat...almost. 03. your nail polish caught my eye....i'm going red this weekend for sure. wow....at 6.30 on a saturday morning this girl had a lot to say! Firstly wanted to say apologies for not being around lately on here and for the fact I have lots of your posts in my reader. I am pouring myself another glass of fizzy (water) but in a wine glass of course and will be back! I adore your 'am a fan' posts and perfect for sitting down and devouring this Sunday evening. There is so much crafty goodness around at the minute that my creative brain is going crazy. Another has been added to my projects list in that embroidery hoops - wow! Hope your busy week is still a good one. Thank you for the lovely catch up that my tardiness provided! Wow, what a wonderful surprise to hear how many people are spreading the word for our service project. It means so much to us that you would go out of your way to serve! I am so touched and grateful. Thank you seems such a small word for how I truly feel. I am truly humbled. Thank you! delicious, loving your blog...am a fan! Love these cupcake photos. Looks delicious! I love your blog. Thanks for sharing so much of your life!!! Pretty new to blogging (less than a year), but I find it so therapeutic to capture the beautiful moments of life in one, safe place... thanks for the inspiration! !